Here is our list with the best Greece mainland destinations. The Greek mainland is not as developed in tourism as the islands, therefore it gives amazing chances to travel off the beaten track and enjoy all the privacy you need in your holidays. A drive around the Greek mainland brings visitors to interesting archaeological sites, picturesque seaside towns and magnificent beaches. This is a guide with the best Greece mainland destinations and cities, ranked by popularity. This ranking is based on our data as a travel guide and not on the official data and statistics of the Greek Ministry of Tourism. Don't know where to go? Try our Location Finder. The capital of Greece, Athens is famous for its long history and the amazing sightseeing. A trip to Greece is not complete without a visit to Athens. The best place for walking, as all sightseeings are found in close distance to each other, Athens is also a transportation hub to the Greek islands. The region of Heraklion has lively beaches on the northern side and secluded, family places on the southern side. In between, visitors will drive by mountainous villages that keep the traditional paces of life and interesting ancient sites, including the world-famous Minoan palaces of Knossos and Phaestos. The westernmost region of Crete, Chania amazes visitors with the Venetian-style Town, the beautiful beaches, the interesting sightseeing and the lovely nature. Do not miss the Venetian port of Chania Town and the trips to Balos and Elafonissi, two beaches with exotic crystal water. Famous for the amazing beach resorts and the lovely nature, Halkidiki gets very popular in summer with both Greek and foreign visitors. The first peninsula of Halkidiki, Kassandra, has the busiest resorts, while the second peninsula, Sithonia, is more calm. The third peninsula, Mount Athos, is a monastic community and entrance is allowed only after special permission. Located between the busy regions of Heraklion and Chania, Rethymno keeps its calm paces even in high season. Visitors will love the Venetian style of Rethymnon Town, the traditional inland villages, like Anogia and Spili, and the lovely beaches, ideal for long relaxing days under the sun. One of the most important archaeological sites in Greece, Delphi is also known as the Naval of the Earth. In the ancient times, this was the most famous oracle of god Apollo and people from all over the Mediterranean would come to ask for advice. The most famous sights of Delphi are the temple of Apollo, the ancient theatre, the ancient stadium and the Archaeological Museum. 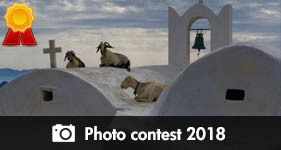 Outside the busy resort of Elounda, the prefecture of Lassithi gives a true and deep sight in the traditional Cretan life. A drive around will bring you to amazing beaches, interesting monasteries and seaside villages. Even in high season, Lassithi remains the secludest region of Crete. Located on the north western coasts of Greece, Parga is a seaside town with lovely island style. At the entrance of the port, there is a small islet with a chapel on top, while a Venetian Castle stands on the hilltop above the town. Apart from the lovely port, Parga also stands for the amazign beaches. Valtos, Lichnos and Sarakiniko amaze visitors with their crystal water and the blue-green colour. Pelion is a region for all seasons. Mount Pelion is actually a peninsula in central Greece, between the Aegean Sea and the Pagasetic Gulf. The eastern side of Pelion gets very popular in summer for the gorgeous beaches and the exotic water. The central part of Pelion is more suitable as an autumn and winter destination, due to the mountainous villages and the lush green nature. Olympia is known as the birthplace of the Olympic Games. The first ancient Olympic Games took place in 776 BC and they were dedicated to the cult of Zeus. In Olympia, you can see the temple of Zeus, the temple of Hera, the Ancient Stadium, the workshop of Pheidias and other constructions. 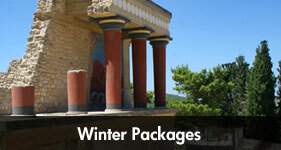 The Archaeological Museum of Olympia is also among the most interesting museums in Greece. 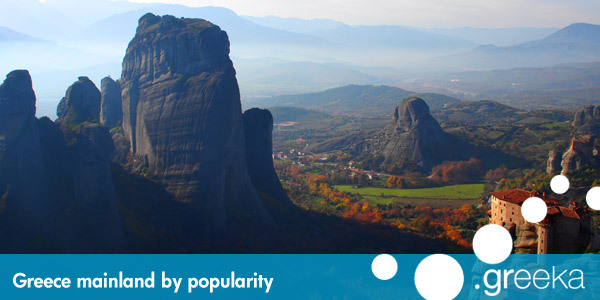 One of the most impressive spots of Greece, Meteora is located on the northern part of the country. They are actually huge granite rocks in the middle of a valley and on top of these rocks monasteries were built in the Byzantine times. The sight as you approach Meteora is stunning and so is the view from Meteora down to the valley. Mount Athos and Meteora are considered the holiest regions in Greece. Among the most popular archaeological sites of Greece, Epidaurus is located on the north eastern side of Peloponnese. Mostly famous for the Ancient Theatre with the amazing accoustics, this site is visited by thousands of visitors every year. The Ancient Theatre of Epidaurus hosts important theatrical performances in summer. The seaside town of Nafplion is a popular holiday destination all year round. Lovely beach resorts surround Nafplion and get much frequented for family summer holidays. A walk around the Old Town of Nafplion will bring you to ample squares, paved streets and elegant mansions. Do not miss a visit to Palamidi Fortress and to the Castle of Bourtzi. Nafplion is also a convenient base for daily excursions and cruise trips to the Saronic islands. The second largest town of Greece, Thessaloniki is located on the northern side of the country. It was founded in the 3rd century BC and took its name from the half-sister of Alexander the Great, Thessaloniki. With a busy beach promenade, large shopping malls, interesting sightseeing and vivid nightlife, Thessaloniki is a nice base for excursions in northern Greece and a transport hub to Halkidiki. Located on the south eastern side of Peloponnese, Gythio is a beautiful town that spreads around a large port. The region stands for the long sandy beaches, the clean water and the mountainous villages. Gythio serves as a convenient base for excursions to Mani, an abrupt and secluded region with traditional towers. Opposite the port of Gythio, there is a small island that can be reached through a narrow pathway.